A new species of the genus Rhacophorus is described from Myanmar. The new species is most similar to R. bipunctatus but differs in the male having a larger body size, a bright green dorsal coloration, yellow in the outer portion of the iris, fainter crossbands on the limbs, a more extensive dermal fringe along the arm, more extensive projection on the heel, more extensive webbing on the hand, and typically two large equal-sized black spots, one in the axillary region and one on the middle of the flank. Ten species of Rhacophorus are thought to occur in Myanmar (R. appendiculatus (Günther), R. bipunctatus Ahl, R. bisacculus Taylor, R. dennysi Blanford, R. feae Boulenger, R. maximus Günther, R. reinwardtii (Schlegel), R. taronensis Smith, R. turpes Smith, and R. verrucosus Boulenger). 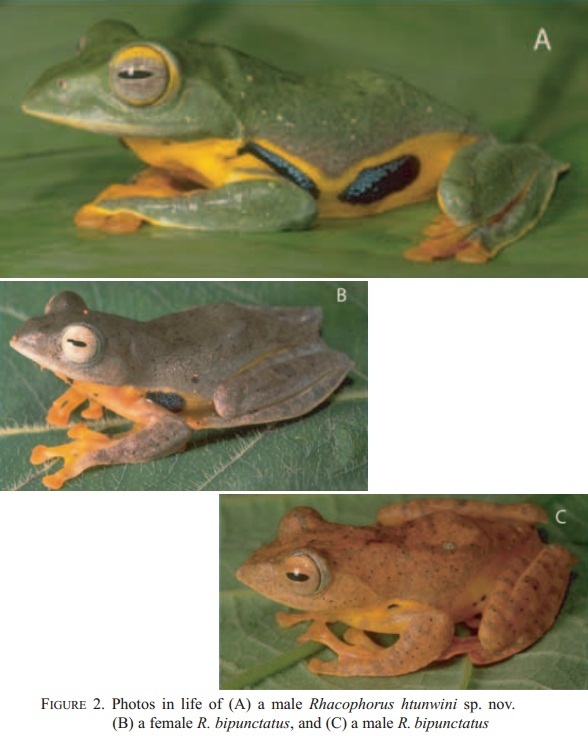 Here, we report on an additional species of Rhacophorus collected during expeditions in 2001 and 2002 to Rakhine State in western Myanmar near the Bay of Bengal and to Kachin State in northeastern Myanmar near the Chinese border. Etymology: The name htunwini is given in honor of the late U Htun Win, who devoted the last eight years of his life to the pursuit of knowledge of the diversity and natural history of the reptiles and amphibians within his country. As team leader of the Myanmar Herpetological Survey Team, he first recognized this frog as potentially new to science. Distribution and Natural History: At present Rhacophorus htunwini is known from Nagmung and Machanbaw Townships, Putao District, Kachin State, and from much further south in Rahkine State in the southwestern foothills of Rakhine Yoma, Gwa Township, and Kyauktaw Township, Sittawe District (Fig. 4). This distributional pattern indicates that this species may be restricted to the Indo-Burman Mountain Range that arcs from southwestern Myanmar along the border with India, and the Eastern Himalayas in northern Myanmar. 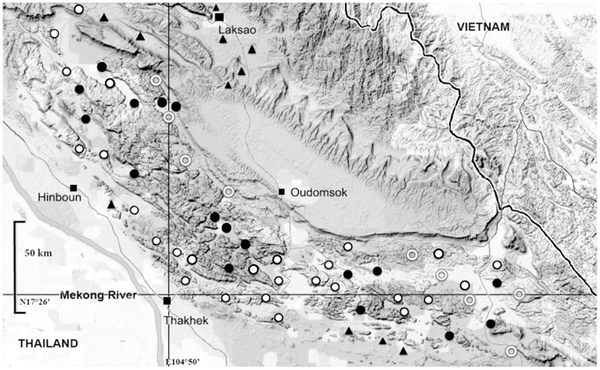 The absence of specimens from the Chin Hills of western Myanmar is probably due solely to a lack of surveys in the region. 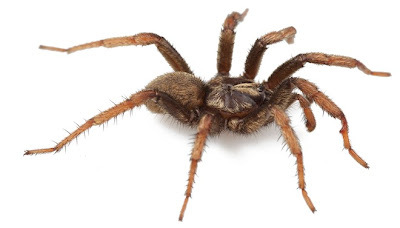 The type specimens including the holotype (CAS 229913, USNM 561869) were found approximately 2 m off the ground in bamboo. Referred specimens were found in undisturbed habitat near a spring (CAS 222136) or seasonal (CAS 221351) and permanent (CAS 222065) streams. Other species of Polypedates and Rhacophorus found in the vicinity of the type locality were P. leucomystax, R. bipunctatus, and R. dennysi. Wilkinson, Jeffery A.; Thin, Thin; Lwin Kyi Soe & Shein, Awan Khwi. 2005. 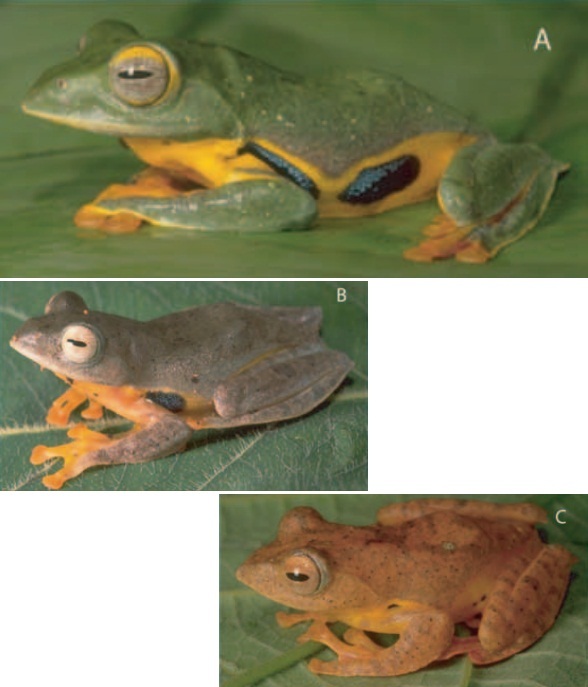 A new species of Rhacophorus (Anura: Rhacophoridae) from Myanmar (Burma). Proceedings of the California Academy of Sciences. 56(4): 42–52. Camchaya thailandica Bunwong, Chantar. & S.C.Keeley, sp. nov. from Phu Phrabat Historical Park, Udon Thani, Thailand is described as a new species. 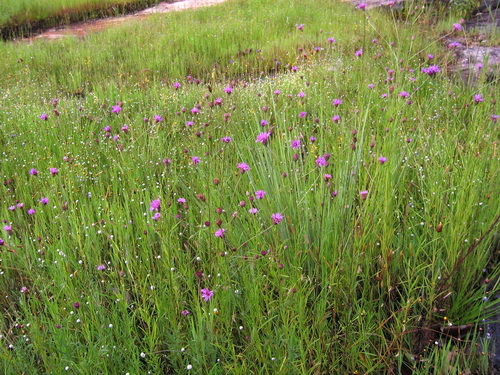 Plant of this new species are similar to Camchaya gracilis (Gagnep.) Bunwong & H.Rob. but differ in having ovate phyllaries without margin spines, 10-ribbed achenes, and broadly ovate leaves. This species is a rare endemic known only from the type collection and probably confined to open areas of sandstone hills in Udon Thani province. Figure 1. Capitulescences, A–B terminal C axillary. 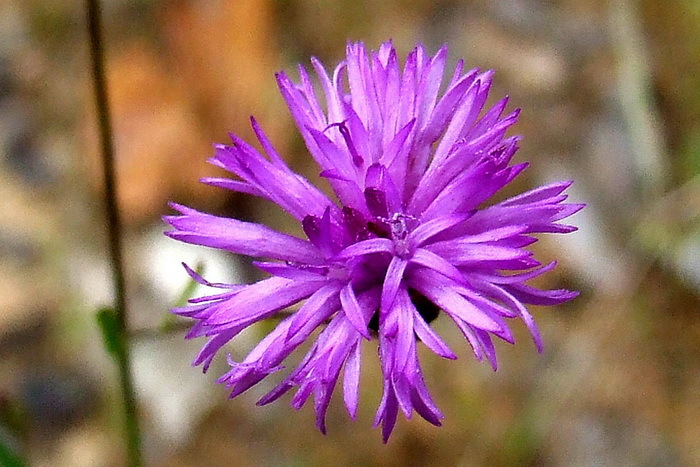 Note that phyllaries are in 5–6 series and without margin spines. Distribution. Endemic to Thailand. Only found in Phu Phrabat Historical Park, Udon Thani province. Ecology. Rocky areas of sandstone hills, scattering in dipterocarp forest, flowering from November and December. พู่ม่วง | Iodocephalopsis eberhardtii (Gagnep.) S. Bunwong & H. Rob. syn: Camchaya eberhardtii (Gagnep.) Kitam. The two species originally described in the genus Iodocephalus Gagnep. are not congeneric. The species that was retained in the genus by Kitamura and stated as the type of the genus by Swart is reduced to synonymy under Camchaya Gagnep., and a new combination Camchaya gracilis (Gagnep.) S. Bunwong & H. Rob. is proposed. 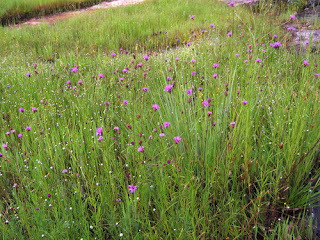 This species is reported for the first time from Thailand. A new genus, Iodocephalopsis S. Bunwong & H. Rob., is established for the second species originally placed in Iodocephalus, and both Iodocephalus glandulosus Kerr and Camchaya eberhardtii (Gagnep.) Kitam. are placed in synonymy under the newly combined Iodocephalopsis eberhardtii (Gagnep.) S. Bunwong & H. Rob. Distribution.— Laos, Thailand, and Vietnam. Ecology.— In open areas of hilly evergreen forest. Flowering September to February. or Laotian Rock Rat. To locals it is known as ‘Ninh Cùng’. 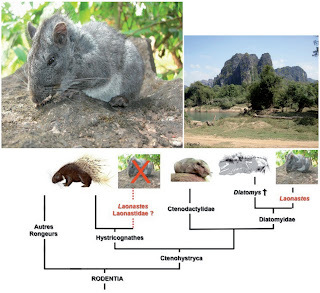 Laotian Rock Rat Laonastes aenigmamus was first discovered in Hin Nammo NBCA, Khammoune Province, Lao PDR in 2005 by Jenkins et al. (2005). This species was later recognized as living species of the ancient family Diatomyidae which was thought to be extinct since the Miocene, about 11 millions years ago. Conservation of this species is recommended at the highest priority not only due to its limited range but also due to its status as the single living representative of an ancient family. 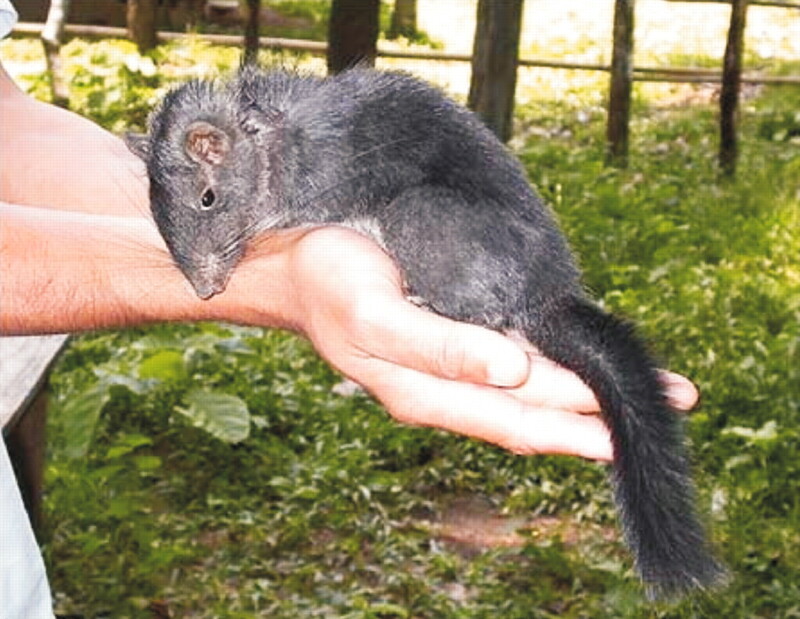 During biodiversity survey on small mammals in Phong Nha - Ke Bang National Park, Quang Binh Province, Central Vietnam, we obtained 4 specimens of un-usual small animals in Thuong Hoa Commune, Minh Hoa District, Quang Binh Province. Based on analysis of appearance, body measurements and skull charasters of these specimens, we confirm that they belong to Laotian Rock Rat Laonastes aenigmamus which was described in 2005 based on specimens collected in Hin Nam No National Biodiversity Conservation Area, Khammoune Province, Lao PDR. Morphological features and some ecological attributes of this species are provided. 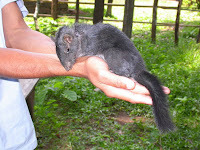 This species is proposed to be included in the Checklist of wild mammal species of Vietnam under name as Truong Son Rat (Annamite Rat). 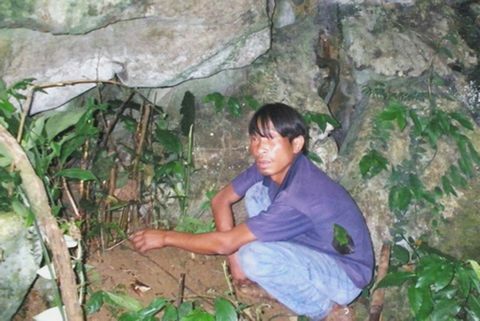 Main threats to Annamite Rat in Vietnam are wildlife hunting/snaring and forest destruction. Snaring small mammals for food and for trade is common habit of local residents in Thuong Hoa and nearby communes. Urgent conservation actions and further studies on population genetics and ecology of this elusive species are recommended. The Laotian rock rat or kha-nyou (Laonastes aenigmamus), a small rodent the size of a rat discovered by chance on a Laotian market, is new to science. This small mammal lives in a very specific rocky habitat, in a seemingly limited territory. Its adaptations to a very specific biotope and lifestyle probably explain its survival and its late discovery. Key words: Laonastes aenigmamus, rodents, new discovery, biotope, anatomical, physiological and behavioural adaptations. 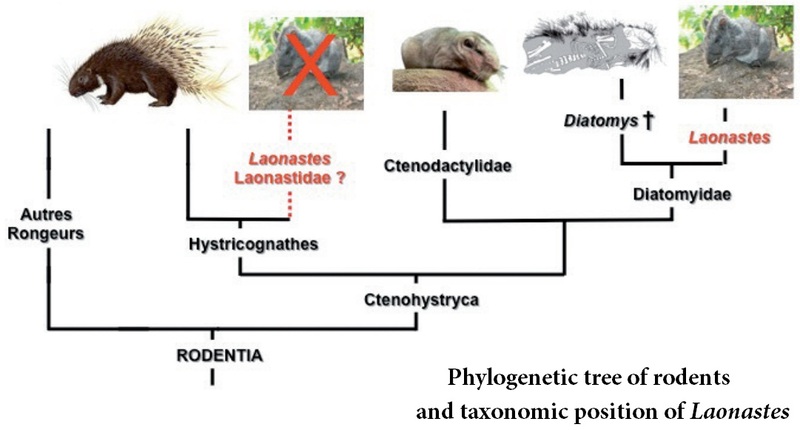 Figure 3: Phylogenetic tree of rodents and taxonomic position of Laonastes. Laonastes belongs to the family of Diatomyidae believed to be disappeared for almost 20 million years ago. Figure 2 : Typical landscape of Khammouan. Keovichit, K., Nicolas, V. & Hugot J-P. 2011. Laonastes aenigmamus, an enigmatic rodent recently discovered in Laos | Laonastes aenigmamus, rongeur énigmatique, récemment découvert au Laos. Bull. Acad. Vet., France. 164, 135-140. Fig. 1. A juvenile Laonastes aenigmamus, captured and released after photography, provides evidence that this species is, indeed, very much alive. Known locally as Kha-nyou, the Laotian rock rat possesses a rat-like head with long whiskers and a furry squirrel-like tail. It lives in the limestone rock outcroppings of central Lao People's Democratic Republic. (Photo by Uthai Treesucon, David Redfield 2006 Lao expedition). 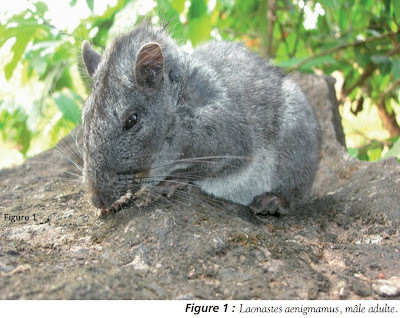 Abstract Laonastes aenigmamus is an enigmatic rodent first described in 2005. Molecular and morphological data suggested that it is the sole representative of a new mammalian family, the Laonastidae, and a member of the Hystricognathi. 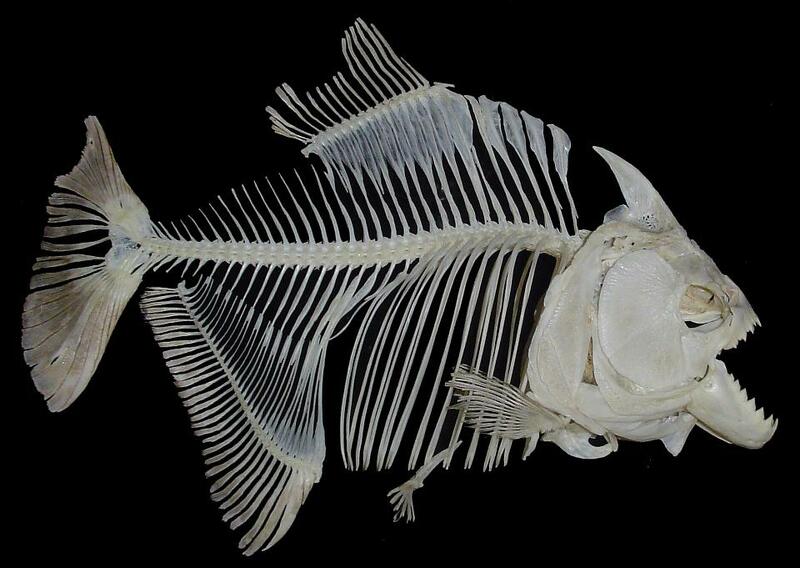 However, the validity of this family is controversial because fossil-based phylogenetic analyses suggest that Laonastes is a surviving member of the Diatomyidae, a family considered to have been extinct for 11 million years. According to these data, Laonastes and Diatomyidae are the sister clade of extant Ctenodactylidae (i.e., gundies) and do not belong to the Hystricognathi. 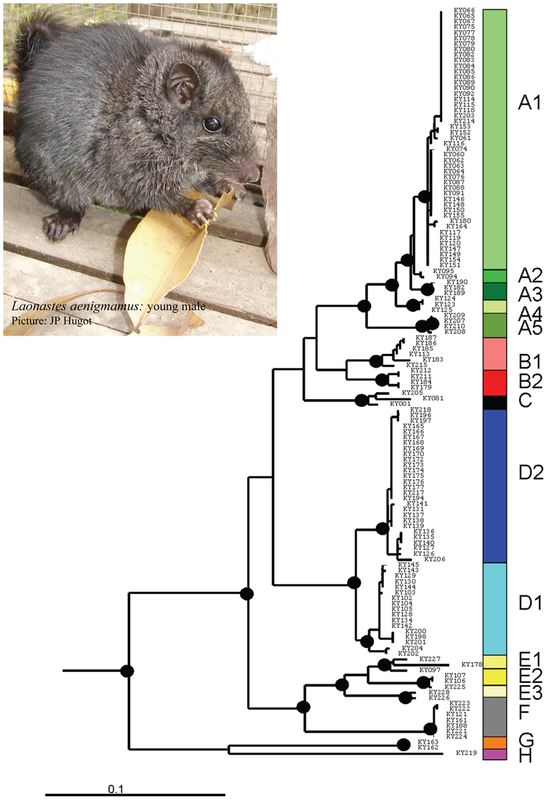 To solve the phylogenetic position of Laonastes, we conducted a large-scale molecular phylogeny of rodents. 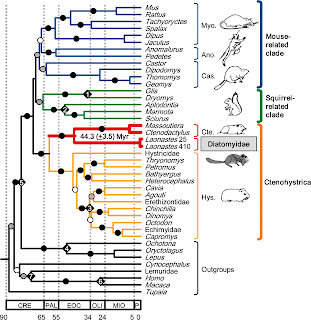 The analysis includes representatives of all major rodent taxonomic groups and was based on 5.5 kb of sequence data from four nuclear and two mitochondrial genes. To further validate the obtained results, a short interspersed element insertion analysis including 11 informative loci was also performed. Our molecular data based on sequence and short interspersed element analyses unambiguously placed Laonastes as a sister clade of gundies. All alternative hypotheses were significantly rejected based on Shimodaira–Hasegawa tests, supporting the idea that Laonastes does not belong to the Hystricognathi. 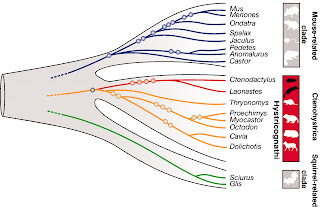 Molecular dating analysis also supports an ancient divergence, ≈44 Mya ago, between Ctenodactylidae and Laonastes. 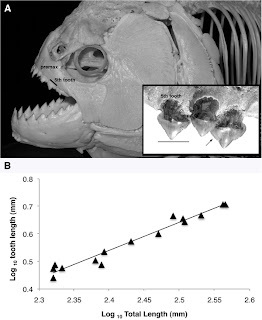 These combined analyses support the hypothesis that Laonastes is indeed a living fossil. Protection of this surviving species would conserve an ancient mammalian family. Fig. 3. 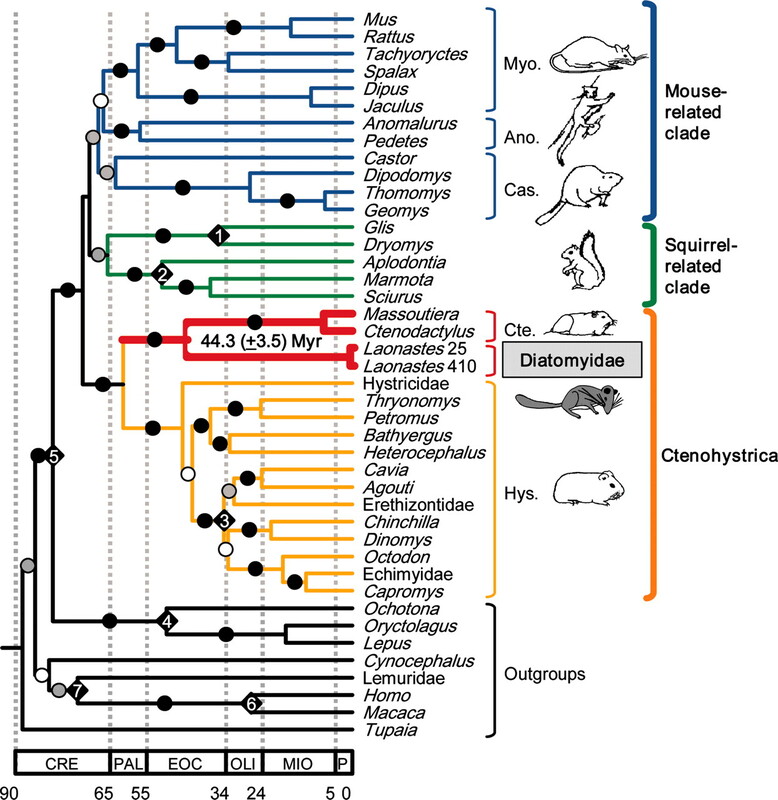 Molecular time scale for the order Rodentia. Fig. 4. 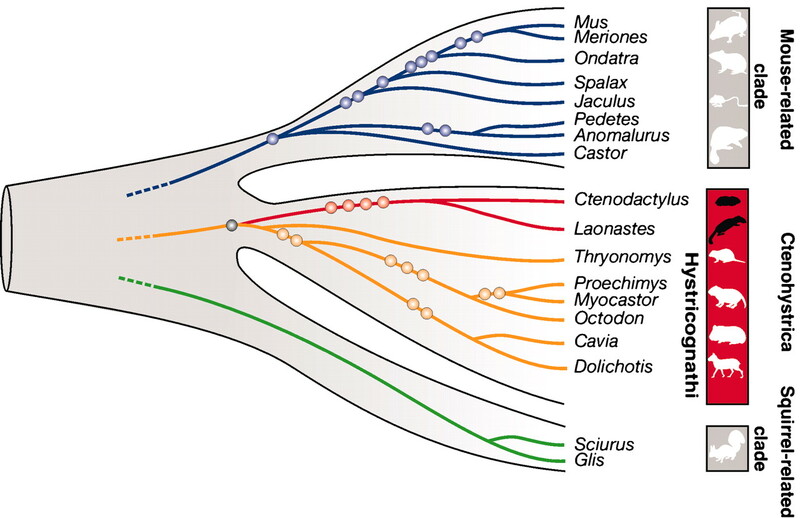 Phylogenetic affiliations of Laonastes based on presence/absence patterns of retroposed SINEs. 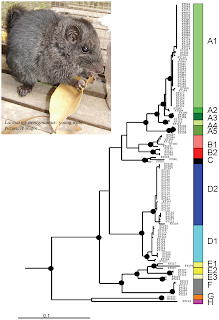 The phylogenetic tree indicates the three major rodent clades: the mouse-related clade, the Ctenohystrica, and the squirrel-related clade. Relationships between primates and snakes are of widespread interest from anthropological, psychological, and evolutionary perspectives, but surprisingly, little is known about the dangers that serpents have posed to people with prehistoric lifestyles and nonhuman primates. Here, we report ethnographic observations of 120 Philippine Agta Negritos when they were still preliterate hunter–gatherers, among whom 26% of adult males had survived predation attempts by reticulated pythons. Six fatal attacks occurred between 1934 and 1973. 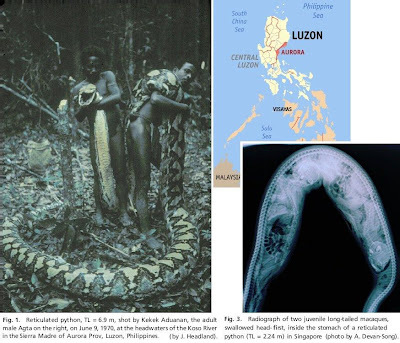 Agta ate pythons as well as deer, wild pigs, and monkeys, which are also eaten by pythons, and therefore, the two species were reciprocally prey, predators, and potential competitors. Natural history data document snake predation on tree shrews and 26 species of nonhuman primates as well as many species of primates approaching, mobbing, killing, and sometimes eating snakes. These findings, interpreted within the context of snake and primate phylogenies, corroborate the hypothesis that complex ecological interactions have long characterized our shared evolutionary history. Thomas Headland and Harry Greene document the frequency of python attacks on a tribe of hunter-gatherers in the Philippines, this is the only study to quantify the danger that snakes pose to humans. Anthropologist Headland lived among the Agta Negritos since 1962, and interviewed 58 men and 62 women regarding their interactions with reticulated pythons. Fifteen of the men (26 percent) and one of the women (1.6 percent) had been attacked, and the interviews recalled six fatal attacks that occurred between 1934 and 1973, although Headland could only confirm two fatal attacks on children. The attacks usually occured on men while they walked in the forest, but 15 of the individuals interviewed remembered a python entering a dwelling at sunset and killing two of three children, swallowing one of them. The data compiled suggests that one tramatic or fatal attack occurs every two to three years in the Agta tribe. The report also focuses on the complex interaction between humans and snakes, so while pythons prey on humans, humans also prey on snakes. Headland documented a 6.9 m reticulated python killed, dressed in less than an hour that provided about 25 kg of meat (see photo). 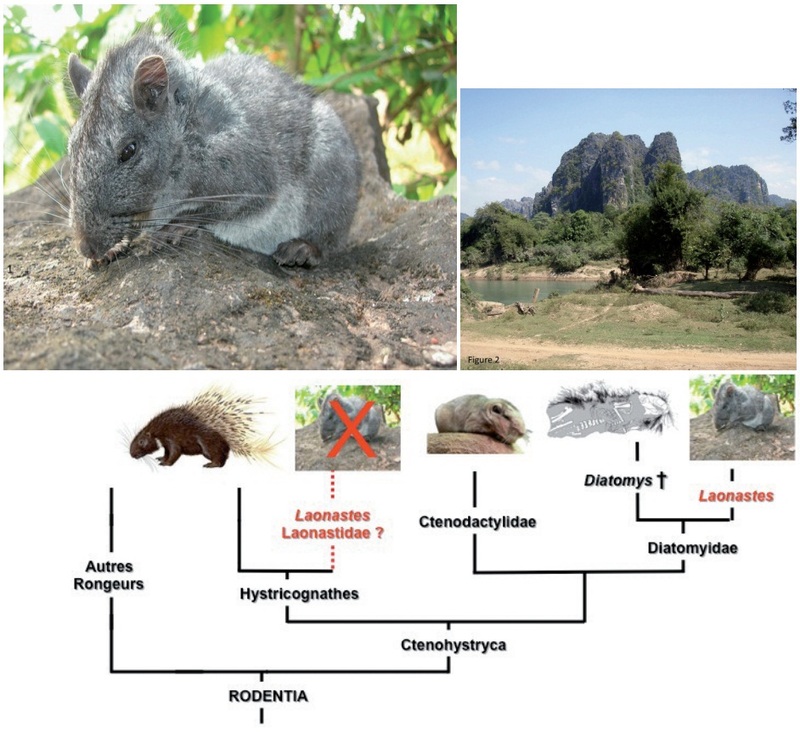 Laonastes aenigmamus is endemic to the limestone formations of the Khammuan Province (Lao PDR), and is strongly specialized ecologically. 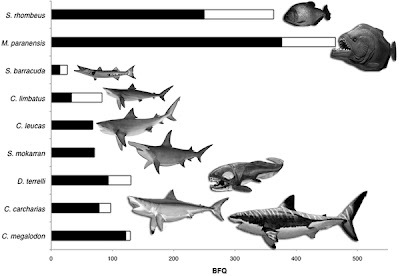 From the survey of 137 individuals collected from 38 localities, we studied the phylogeography of this species using one mitochondrial (Cyt b) and two nuclear genes (BFIBR and GHR). Cyt b analyses reveal a strong mtDNA phylogeographical structure: 8 major geographical clades differing by 5–14% sequence divergence were identified, most of them corresponding to distinct karst areas. Nuclear markers display congruent results but with a less genetic structuring. Together, the data strongly suggest an inland insular model for Laonastes population structure. With 8 to 16 evolutionary significant units in a small area (about 200×50 km) this represents an exceptional example of micro-endemism. Our results suggest that L. aenigmamus may represent a complex of species and/or sub-species. The common ancestor of all Laonastes may have been widely distributed within the limestone formations of the Khammuan Province at the end of Miocene/beginning of the Pliocene. Parallel events of karst fragmentation and population isolation would have occurred during the Pleistocene or/and the end of the Pliocene. The limited gene flow detected between populations from different karst blocks restrains the likelihood of survival of Laonastes. This work increases the necessity for a strict protection of this rare animal and its habitat and provides exclusive information, essential to the organization of its protection. Eroded limestone outcrops form a prominent part of the landscape in Southeast Asia. 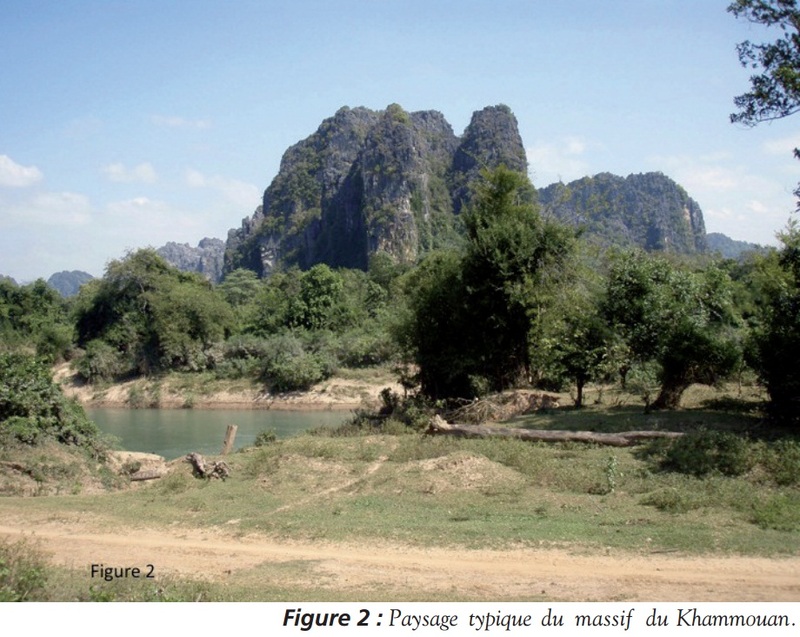 Because of high limestone weathering erosion in these areas resulted in scattered, isolated limestone hills with steep flanks called karsts towers. Despite a high diversity of habitat specialists and endemic taxa, these limestone karsts remain among the least studied ecosystems in Southeast Asia. Between 1985 and 2004 they contributed only to 1% of the global and regional biodiversity research output from terrestrial and freshwater ecosystems, while they cover around 10% of the land area in Southeast Asia. 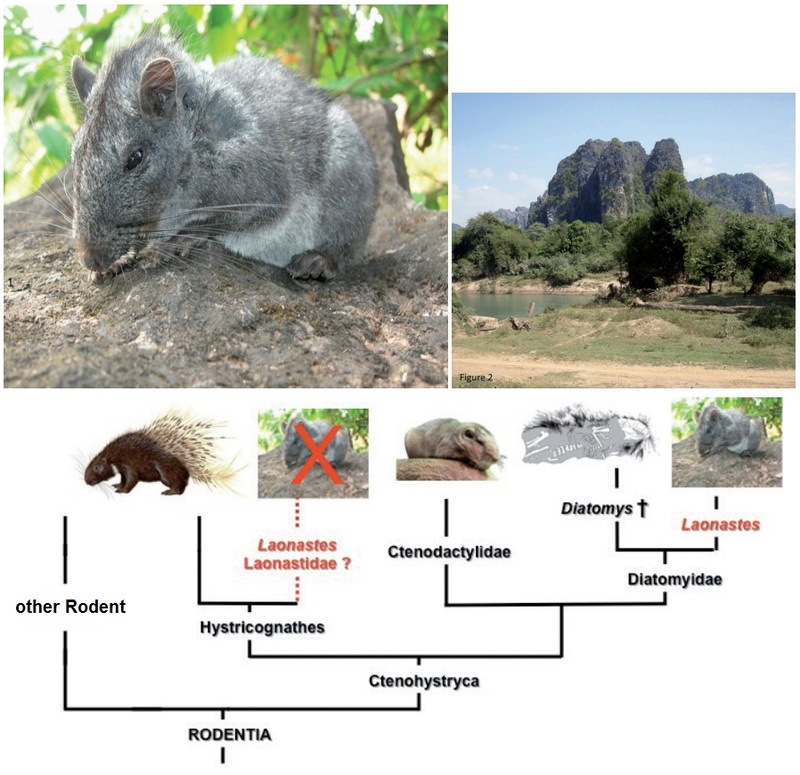 However, in the Khammuan Province of Lao PDR, several new endemic vertebrate species were recently described: a bird, Pycnonotus hualon, a bat, Hipposideros scutinares, a gymnure, Hylomys megalotis, and a murid rodent, Saxatilomys paulinae. Laonastes aenigmamus, recently described from this region by Jenkins et al., is of special interest. Using comparative morphological and molecular data, this new species was initially described as a member of a new genus and ranked within the Hystricognathi rodents in a new family: the Laonastidae. But, further studies demonstrated: first, that L. aenigmamus is a member of the Diatomyidae, a fossil family known from early Oligocene to late Miocene in Pakistan, India, Thailand, China, and Japan; second, that the Diatomyidae are the sister group of the Ctenodactylidae, a family of small rodents found in rocky deserts across the northern parts of Africa; third, that together with the Hystricognathi, the Diatomyidae and the Ctenodactylidae form the suborder Ctenohystrica. In a previous study we presented a preliminary analysis of the genetic diversity of L. aenigmamus: 52 specimens were sampled and the population structure was surveyed by sequencing 887 base pairs of the Cytochrome b (Cyt b) gene. Phylogenetic and haplotypic network reconstructions revealed three well-supported and rather divergent lineages, suggesting that L. aenigmamus populations are geographically structured. 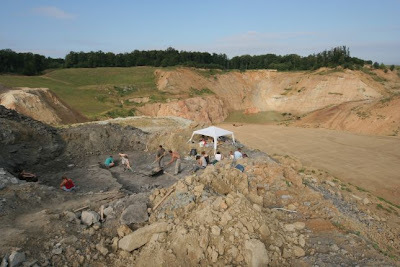 However, altogether these samples represented a limited part of the estimated range of the species; most of them were sampled in local markets and their exact geographic origin was impossible to determine; this study was based on a fragment of a single mitochondrial gene. Before its scientific discovery, the kanyou was considered as a kind of game, trapped and eaten by the villagers. 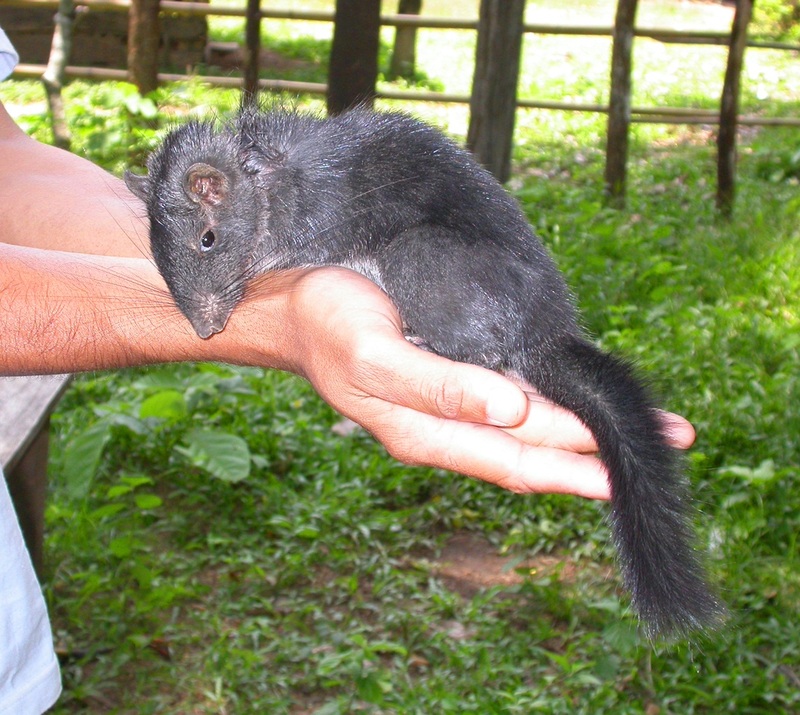 Since 2008, the conservation of L. aegnimamus is regulated in Lao PDR and since 2009 this species is listed as «Endangered» on the IUCN Red List. During the last four years we add the unique opportunity to accompany local officers in the field when they explained this change to local populations, and to sample for molecular analyses the last specimens that were captured by traditional hunters. We were able to sample 137 individuals for which the exact locality of collect was known. It represents 38 localities probably spanning the whole geographical range of the species. Thus, the sampling obtained for this study is exceptional both in terms of number of individuals and number of localities sampled and will not be able to be carried out again. In the present study we: (1) improve evaluation of the genetic diversity and delineation of the phylogeographical structure of L. aenigmamus, by sequencing both nuclear and mitochondrial markers of a larger number of geographically referenced individuals; (2) obtain a better definition of the geographical distribution of the species; (3) highlight the spatial and temporal history of the limestone formation of the Khammuan Province, using the evolutionary history of this species as a guide. Our analysis strongly underlines the necessity for a strict protection of this rare animal and its habitat and provides exclusive information, essential to the organization of its protection. 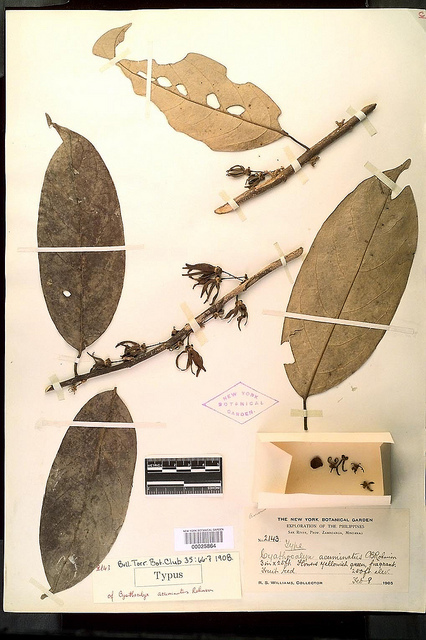 A revised classification of the species of Cyathocalyx (Annonaceae) occurring in western Malesia (Peninsular Malaysia, Sumatra, and Borneo) is presented, with distribution maps. 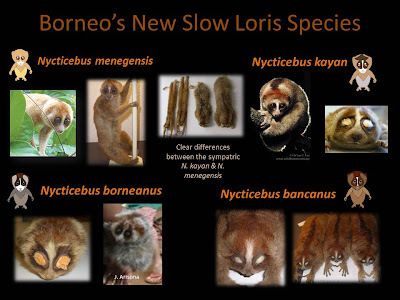 Fifteen species are recognized, including two that are newly described from Borneo (C. angustipetalus and C. magnifructus), which are illustrated. Several important nomenclatural changes are validated, including the elevation of Drepananthus carinatus var. deltoideus to specific rank as C. deltoideus, and the transfer of the name Parartabotrys hexagynus to Cyathocalyx as C. hexagynus. 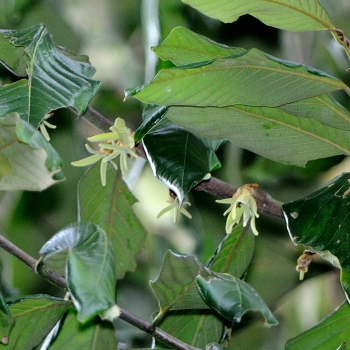 Other notable nomenclatural changes include the reduction of the name C. scortechinii to synonymy with C. pubescens. A comprehensive taxonomic revision of the Philippine representatives of the genus Cyathocalyx (Annonaceae) is presented for the first time. 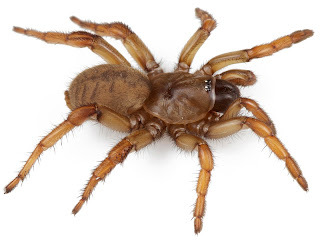 Five species are recognized, including two endemics that are newly described (C. crassipetalus and C. samarensis). The utility of specific taxonomic characters is also evaluated, with particular emphasis on leaf indument and occurrence of crystals; sepal and petal shape; carpel number; monocarp size and shape; pericarp thickness; presence of stipes; seed size and shape; and prominence of the raphe. The conservation status of each species is evaluated according to current IUCN Red List categories and criteria. Keywords: Annonaceae, Cyathocalyx crassipetalus, Cyathocalyx samarensis, new species, systematics, taxonomy. Rui Jiang Wang and Richard M. K. Saunders. 2006. The Genus Cyathocalyx (Annonaceae) in the Philippines. Systematic Botany. 31,(2) (Apr. - Jun., 2006), 285-297. Mosasauroids are conventionally conceived of as gigantic, obligatorily aquatic marine lizards (1000s of specimens from marine deposited rocks) with a cosmopolitan distribution in the Late Cretaceous (90–65 million years ago [mya]) oceans and seas of the world. 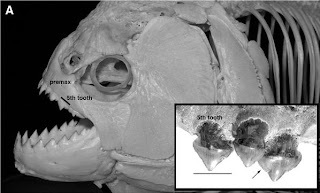 Here we report on the fossilized remains of numerous individuals (small juveniles to large adults) of a new taxon, Pannoniasaurus inexpectatus gen. et sp. 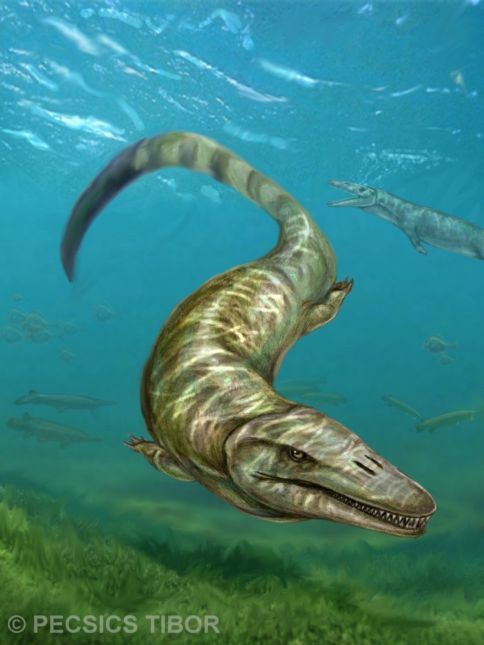 nov. from the Csehbánya Formation, Hungary (Santonian, Upper Cretaceous, 85.3–83.5 mya) that represent the first known mosasauroid that lived in freshwater environments. Previous to this find, only one specimen of a marine mosasauroid, cf. Plioplatecarpus sp., is known from non-marine rocks in Western Canada. Pannoniasaurus inexpectatus gen. et sp. nov. uniquely possesses a plesiomorphic pelvic anatomy, a non-mosasauroid but pontosaur-like tail osteology, possibly limbs like a terrestrial lizard, and a flattened, crocodile-like skull. 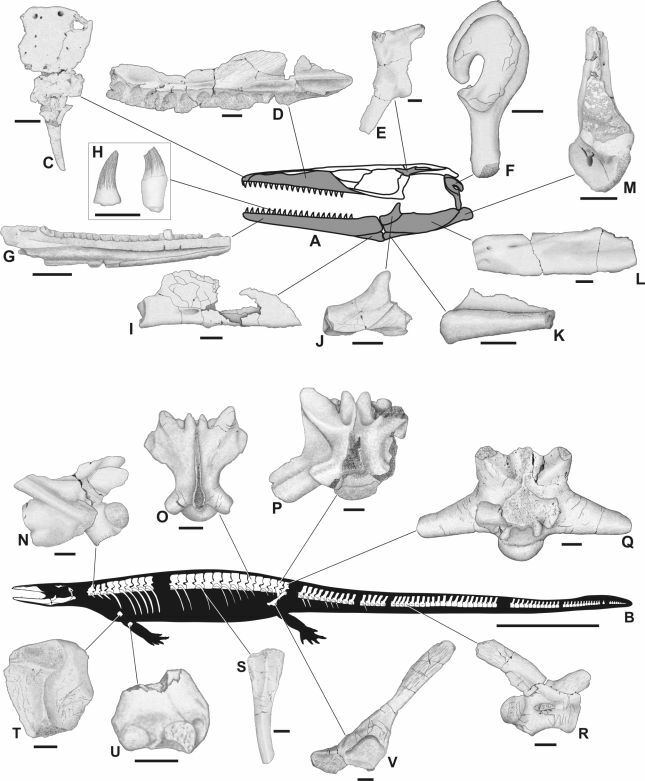 Cladistic analysis reconstructs P. inexpectatus in a new clade of mosasauroids: (Pannoniasaurus (Tethysaurus (Yaguarasaurus, Russellosaurus))). P. inexpectatus is part of a mixed terrestrial and freshwater faunal assemblage that includes fishes, amphibians turtles, terrestrial lizards, crocodiles, pterosaurs, dinosaurs and birds. Etymology. The generic name is derived from the ancient Roman province “Pannonia” in the Transdanubian part of Hungary and “saurus”, New Latin word from Greek ‘sauros’, meaning lizard; the specific epithet “inexpectatus”, meaning unexpected in Latin, refers to the unexpected occurrence of this mosasaur in freshwater environments. More species of nocturnal primates are now recognized than in the past, because many are cryptic species. Subtle morphological disparities, such as pelage pattern and color variation, vocal cues, and genetics have aided in elucidating the number of diagnosable species in a genus. The slow lorises (genus Nycticebus) once included only two species, but recent taxonomic studies resulted in the description of three additional species; further incompletely explored variability characterizes each of the currently described species. 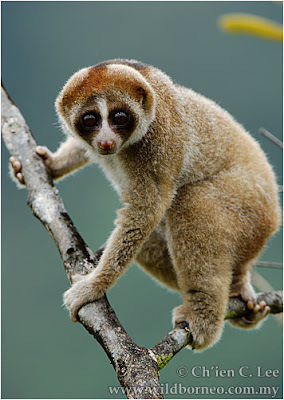 The Bornean loris in particular is characterized by pelage and body size variation. 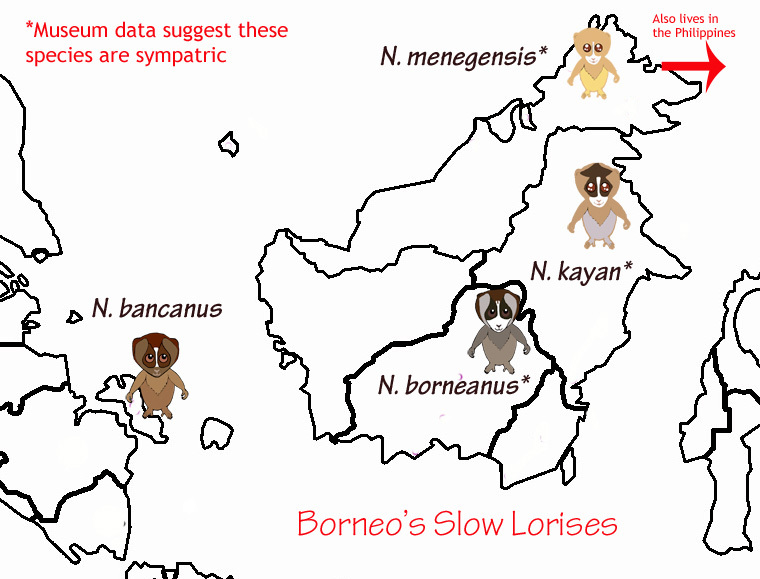 In this study, we explored facemask variation in the Bornean loris (N. menagensis). Differing facemask patterns, particularly inﬂuenced by the amount of white on the face, signiﬁcantly clustered together by geographic regions, separated by notable geographic boundaries. Our results support the recognition of four species of Bornean lorises: N. menagensis, N. bancanus, N. borneanus, and N. kayan. 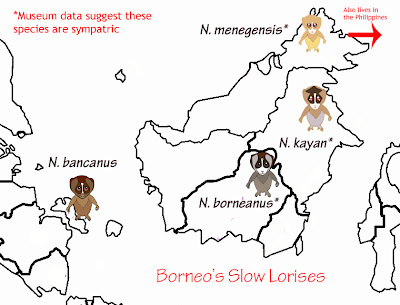 Genetic studies are required to support these ﬁndings and to reﬁne further our understanding of the marked variability within the Bornean loris populations. Etymology: The speciﬁc name kayan comes from the Kayan River, which ﬂows through the range of the species, close to the type locality of Peleben. Distribution: Nycticebus kayan is located in central and northern Borneo (Sarawak, Sabah, and East Kalimantan). Its southern range extends to the Mahakam River in East Kalimantan and the Rajang River in Sarawak. It is found as far north as the base of the southern part of Mt. Kinabalu in Sabah. It spans the width of Borneo, east to west, but unlike its neighbor (N. menagensis), it appears not to be found along the coast. It is sympatric with N. menagensis in East Kalimantan and Sabah. An international team of scientists studying the elusive nocturnal primate the slow loris in the jungles of Borneo have discovered an entirely new species. The team's analysis of the primate's distinctive facial fur markings, published in the American Journal of Primatology, reveals the existence of one entirely new species, while two of species, previously considered as possible sub-species, are being officially recognized as unique. "Technological advances have improved our knowledge about the diversity of several nocturnal mammals," said Rachel Munds from the University of Missouri Columbia. "Historically many species went unrecognized as they were falsely lumped together as one species. While the number of recognized primate species has doubled in the past 25 years some nocturnal species remain hidden to science." The slow loris (Nycticebus) is a primate genus closely related to the lemur. 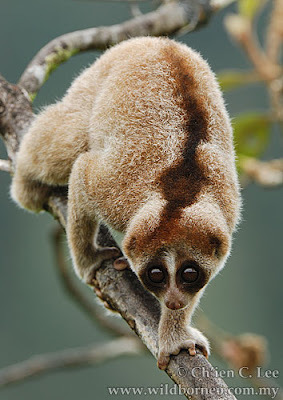 Found across South East Asia, from Bangladesh and China's Yunnan province to the island of Borneo, the slow loris is rare amongst primates for having a toxic bite, and is rated as Vulnerable or Endangered on the IUCN Red List. 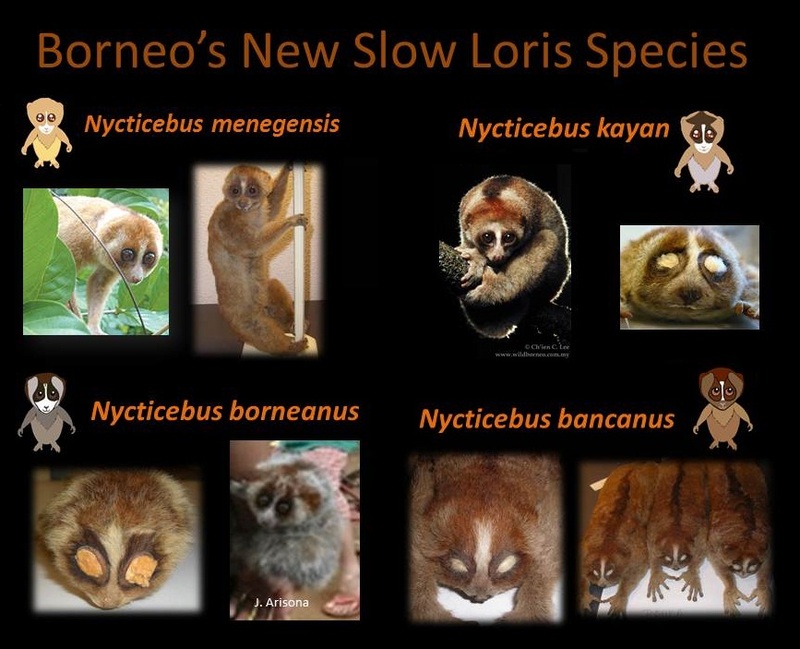 Differences among these facemasks resulted in recognition of four species of Bornean and Philippine lorises, N. menagensis, N. bancanus, N. borneanus and N. kayan. Of these Nycticebus kayan is a new group unrecognized before as distinct. This new species is found in the central-east highland area of Borneo and is named for a major river flowing in its region, the Kayan.